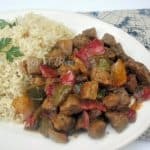 This recipe for Quick Beef Tips with Vegetables, is exactly what I mean – quick ! And it tastes as if you had it on the stove for hours. To make this an even better meal, it is also low in fat. As long as you cut away all visible fat from the meat, that is. We still have cool nights in South-Africa – even after a day of intense heat. And I love to serve this quick Beef Tips with Vegetables for dinner on those nights. Truthfully, I make this dish during Summer as well. My family loves the deep, rich taste which develops so quickly and all you need to serve it with, is some rice. Or mashed potatoes if you’d prefer. I do serve a small crunchy side salad with it, but only on days when I have time to make something extra. Serve warm with Brown Basmati Rice and a salad on the side. Yum that looks like a great dinner. Looks delicious – and I love how quickly it comes together. 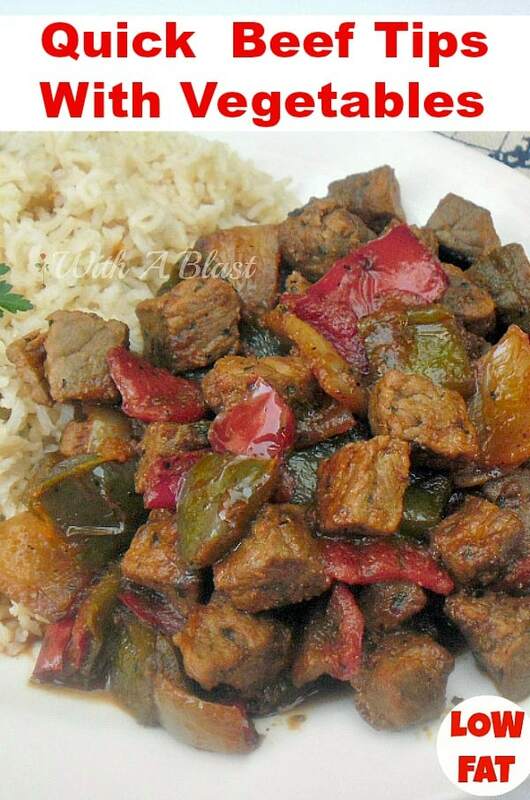 Great flavors in your Quick Beef Tips with Veggies, we will love this dish. Hope you are having a fantastic weekend and thanks so much for sharing this awesome post with Full Plate Thursday.